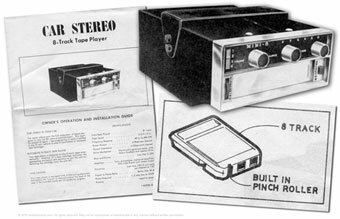 In 1964, Bill Lear and the engineers at the Lear Jet Corporation, in conjunction with the contributions of several other corporations that included Motorola, Ampex, RCA, Ford and General Motors, released the Lear Jet Stereo 8, the first consumer 8-track tape player. Magnetic tapes encased in a housing had been around since the fifties, most notably in 4-track form. Radio broadcasters had been using a similar cartridge in the mid-50s, to make it easier to play jingles and commercials on demand. The 8-track cartridge as introduced by Bill Lear consisted of 4 programs, 2 tracks each, building on earlier inventions. In previous incarnations, the tape was set to run in a continuous loop. Tracks were switched by the means of a metal foil that activated the sensor in the playback mechanism. Lear’s main alteration in the cartridge was moving the rubber pinch roller, formerly part of a playback mechanism, into the cartridge itself. By 1967, Ford offered an 8-track player as an option to all its vehicle models, and RCA began releasing 8-tracks for its catalog of artists. This combined effort helped the 8-track gain credibility and popularity. Once consumers saw its portability and convenience, the era of the 8-track was underway. Plagued with consumer problems from the start, the 8-track cartridge proved large and kinda clunky, filling up interior console bins and making storage inside a car more difficult. That notwithstanding, what irked most people Mister Boomer knew was the constant tape hiss and loud ker-chunk heard when the tracks were changing, which often happened within the middle of a song. Restricted to the tape’s eight tracks, albums had to be readjusted to conform to the technology’s requirements. This meant reconfiguring song order in many cases, songs being broken between tracks, and, in some situations, songs repeated or content added to fill the tape. By the 1970s, the 8-track was on the way out. Cassettes, though introduced in 1963, didn’t overtake the 8-track until the late 70s. Consumers discovered that cassettes were cheaper than 8-track tapes, and record companies had to take a hard business look at the various formats they were publishing: vinyl, 8-track and cassette. By the time compact discs gained in popularity in the early 80s, the 8-track’s day in the sun had waned. Mister Boomer’s entry into the world of the 8-track began in the summer of 1972. His brother had installed a unit in his own car a couple of years earlier, and now was selling that car. He removed the 8-track player and, since his newer auto would have a built-in 8-track player, offered the older unit as a hand-me-down to Mister B. That's right, boomers. This is an actual scan of the owner's manual for Mister B's in-car 8-track player. Brother Boomer helped Mister B install the unit inside the glove compartment of his 1964 Plymouth. The Mini-8 fit perfectly. Instead of permanently securing it to the included hanging bar, though, a locking mechanism was installed in the roof of the compartment. The male counterpart was attached to the top of the unit. This allowed it to slide and lock into the bracket so the unit could be removed and carried when leaving the car, providing an extra layer of security. Tape players were a common target of auto break-ins. Employing a hacksaw blade from their father’s toolbox, the two boomer boys cut holes in the door panels and back window deck to house the speakers. True stereo sound would now be achieved. A few wires and a fuse later, the unit was ready for a test drive. Despite the easy fit of the player in the glove box, the 8-track tapes themselves were six inches long. Inserted into the unit, approximately two inches remained outside the entry slot to enable the cartridge to be grabbed and removed. This meant that when Mister B wanted to activate the unit, the glove box needed to remain open, as the tape extended beyond the compartment. It also meant the tape would be out of reach while driving. It was portable music on demand all right — as long as you inserted a tape before getting underway. Nonetheless, the floodgates now open, Mister B began buying 8-tracks, and added more titles to his annual family Christmas list. His girlfriend at the time had an interest in Elton John (Rocket Man), Cat Stevens (Peace Train) and Chicago (Does Anybody Really Know What Time It Is? ), so naturally those purchases had to be made. Sitting in the passenger seat, she could control the volume and, since there was no rewind, click through the tracks to her heart’s content. Yet there was more. Mister B took this new in-the-car portability as the chance to discover new music he might not be able to play on the home “Victrola,” as Mister B’s mother called the family phonograph. This experimentation resulted in Jethro Tull (Aqualung; Thick As A Brick), The Doors (Best of the Doors), Santana (Abraxas), Crosby, Stills, Nash & Young (Deja Vu; 4-Way Street) and even Iron Butterfly (In-A-Gadda-Da-Vida) joining the collection. As a free-thinking, red-blooded American male, classical music on 8-track sat side by side with the rock ‘n roll in the Mister Boomer 8-track library (Best of Beethoven; Best of Tchaichovsky; Mozart Symphony in G Minor; Bach’s Brandenburg Concertos). It may have been clunky, annoying and inconvenient, but it was your music when you wanted it. In the early 80s, Mister Boomer was heading out to seek his fame and fortune away from Middle America. The entire 8-track collection, numbering in the vicinity of 80 tapes, were quickly sold, along with their storage cases, at a garage sale. Never climbing on the cassette bandwagon, Mister B’s personal portable music would have to wait until the introduction of the iPod before he forayed back into the realm. Grade school music classes certainly varied from place to place for boomers. While some received a healthy dose of musical meanderings, sprinkled with a soupçon of history, others had what amounted to a Mitch Miller songbook that could potentially set back music appreciation a generation. Mister Boomer’s musical education fell into the latter category. Parochial schools were supposedly known for better math and science classes than their public counterparts. Mister B can testify to the math category, but not so much on the science side. When it came to music classes, though, it was a whole other story. Mister B can’t vouch for public school music classes, but they did seem to have some choices. For years, we’d have a music class once a week that consisted entirely of opening a book and singing a few songs. There was no band practice. There was no record player introducing us to the great music of the world. Perhaps that’s why Time Life felt they had a void to fill? For us, a book and a nun equaled music appreciation. By fourth grade the students had pretty much had enough. Every week, Sister Ukulele — or Eugenics, it’s hard to remember since all the nuns had strange names — would lead our “music” lesson. “They don’t make nun names like that no more,” as Thom Sharp observed a decade later. Sister Uke would deposit the music books on the front desk of each row at the appointed time, triggering a domino effect as students took one and passed the rest down the row. Before we opened the books, she’d request that the class do a “warm-up.” It was always the same: Rounds, row by row, of Row, Row, Row Your Boat. Oh, the irony. She wouldn’t be satisfied until, like the plate juggler on The Ed Sullivan Show, she’d have all six rows in action, creating a cacophony of row-row-your-boatness. Then came the main course. “Turn to page 43,” she’d say. We all knew what page that was. The Kookaburra song. Again. Still stuck in some gum tree and laughing at us, no less. The class response was less than enthusiastic as she took her position, front and center, her book cradled in one hand, the other conducting with as vigorous an arm swing as her habit would allow. We weren’t laughing. We were barely mumbling. “Come on, now,” she would urge. No dice. We’d had enough of some Australian bird song. Sister Uke would have to be satisfied with a half-hearted attempt from her classroom of tweens. One fine day as the dreaded music hour arrived, the good Sister had a surprise for us. Instead of passing out the books, she dropped a stack of mimeographed sheets at the front of each row. Receiving the paper, we could see she’d taken to heart the teachings of Vatican II: She was attempting to make her music class more relevant for contemporary times. On that mimeo-smelling sheet, in faded purple ink, were the typewritten lyrics to Jan & Dean’s, Little Old Lady from Pasadena. It’s hard to say whether the class was in complete shock, or we were collectively rolling our eyes. Not a sound was uttered. “You ALL know this one, don’t you?” queried Sister Uke. No response. “OK, it goes like this…” at which point she sang the first stanza in her mezzo-soprano nun voice. She was greeted with open-jawed silence. Mister B couldn’t help but think the whole scene was, man, so not cool, to hear this old woman singing about a shiny red superstock Dodge. Yet she persisted. “OK, the boys will sing the verses and the girls will sing the ‘Go, Granny‘ lines,” she commanded. Putting her conducting arm in motion, she tried to kick it off, but no one was joining in. Before she could reach the first “Go, Granny,” we had taken that 4:4 beat, dug in our heels and choked it to a halt. Frustrated but not deterred, she drove on, conducting like Toscanini yielding a whip while herding cattle, now moving up and down the aisles to see who was really singing and who was just mouthing the words. She tried one more class to inject some enthusiasm into us before scrapping the Great Jan and Dean Experiment. Somehow, she did get the message. The following week, we didn’t have to sing Little Old Lady from Pasadena, or Kookaburra. “Turn to page 47,” she said. Just like that we had a new song. Waltzing Matilda. Today’s “Glee”-ful followers probably can’t relate to that experience as their classes are so involved with whatever the current phrase is for gettin’ jiggy with it. Football players and cheerleaders singing in a chorus? Only if there was a scowling nun hovering over them, if you ask Mister B. What music class memory helped shape your boomer experience? *Kookaburra copyright by Larrikin Music; reproduced solely for the purpose of historical content and comment.